Batley Bulldogs produced a lacklustre display as they slipped to a 22-18 defeat in their opening Betfred Championship game at home to Barrow Raiders. 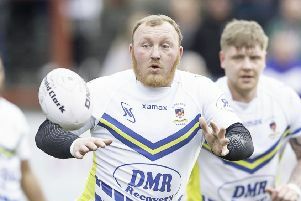 It was the first time since 2001 that Barrow had left Mount Pleasant with victory but it was a poor Bulldogs display - both in attack and defence - which cost them. Batley led 18-14 at half-time having played down the slope but they were nilled in the second half as Barrow turned the game. Too often when in possession, individual errors prevented Batley from threatening the Raiders line, while defensive mistakes allowed Barrow to secure the points. Batley had begun the game brightly and led after just four minutes when Dominic Brambani spun in a tackle and was held close to the line before a short pass sent Sam Wood crashing over for a try, which Dave Scott improved. The Bulldogs stormed back down the slope and were threatening again when a Louis Jouffret pass was palmed into the air by Jake Spedding and the Raiders centre gathered the ball and raced 90 metres up the slope, outpacing the cover defence for a terrific individual try, which James Dallimore converted. Dallimore was sin-binned soon after for using his knees in a tackle and Batley piled on the pressure. Jack Downs looked to have sent Adam Gledhill storming through a gap but play was brought back for a forward pass before the same player knocked on with the Bulldogs in another good attacking position. Batley forced Barrow to drop out from between their own posts and when the kick failed to get out of their own 25, the Bulldogs mounted another attack. Dallimore was waiting on the sidelines to return when Gledhill drove for the line but was tackled, before Alistair Leak forced his way over between the posts from acting half-back and Scott converted. Barrow immediately forced Batley into a knock on and they hit back when Jonathan Smith scored wide on the left. Dallimore pulled his conversion attempt wide and the Bulldogs held a slender 12-10 lead. Batley scored a third try when Jouffret fed Brambani and the scrum half stepped inside the Barrow defence and raced over for a try to the right of the posts, with Scott again converting. Barrow again narrowed the gap before half-time when Spedding kicked towards the corner and Wayne Reittie slipped at a crucial moment, gifting Spedding his second try in the corner, but Dallimore was unable to convert. Errors continued to disrupt play at the start of the second half but it was Barrow who went ahead for the first time in the 53rd minute when Lewis Charnock broke a weak tackle 20 metres out and held off a second Batley defender on his way to the line. Dallimore added the conversion to edge the Raiders 20-18 in front. Dallimore also kicked a penalty following a head high tackle soon after but the Bulldogs did have chances to rescue the game. Back-to-back penalties put Batley on attack but Jouffret was pushed into touch on the right. Five minutes from full-time, Batley were threatening again but Spedding stepped out of the line and almost intercepted another Jouffret pass but knocked on when having a clear run down the slope. Barrow managed to wind the clock down and ensure they nilled Batley in the second half to record a rare win at The Mount. Batley Bulldogs: Scott; Reittie, Wood, Galbraith, Campbell; Jouffret, Brambani; Gledhill, Leak, Everett, Manning, Downs, Dickinson. Subs: Brown, Taira, Ward, Tomlinson. Barrow Raiders: Ritson; Amean, Cross, Spedding, Loxam; Dallimore, Charnock; Walker, Puara, Johnson, SMith, Walne, Aspinwall. Subs: Johnston, Stack, Minoga, Duffy.